Ben Brown Fine Arts presents Awol Erizku's first solo exhibition in Asia at our Hong Kong gallery. Entitled 慢慢燃燒 Slow Burn, the exhibition will feature a group of seven new light works, building on Erizku's tradition of working in neon and simultaneously referencing the indelible history and iconic significance of neon signage in Hong Kong's streets and skyline. 慢慢燃燒 Slow Burn follows the artist's highly acclaimed exhibition Make America Great Again, held in 2017 at Ben Brown Fine Arts London. Erizku's practice has always been underpinned by the possibilities and impact of neon and light works, starting with his senior thesis at The Cooper Union, New York, for which he transformed Barack Obama's Twitter handle into a large-scale neon work, and continuing in his exhibition at the FLAG Art Foundation in New York, in which he emblazoned the words 'Addis Ababa' in Amharic script (the official language of Ethiopia)- the literal translation of the exhibit title, New Flower. The artist has since included neon works in his subsequent exhibitions, alongside his paintings, photographs and installations. 慢慢燃燒 Slow Burnwill be the first exhibition in which large-scale, wall-mounted light works will be shown exclusively, accompanied by a 'conceptual mix-tape' produced specifically for the exhibition. Throughout his career, Erizku has created a unique visual language and distinctive iconography that address issues of race, identity, politics and cultural history, while drawing from myriad references ranging from urban culture to advertising to the art historical canon. Central to the exhibition is The Black Man in Africa has Strong Warriors and Beautiful Cities (2018), a powerfully incandescent rendering composed of fluid lines which blur the division between painting and sculpture, taking inspiration from Robert Rauschenberg's Green Shirt (1965) and featuring imagery from the storied Black Panther Coloring Book created in 1968 by artist and aspiring Black Panther Party member Mike Teemer. 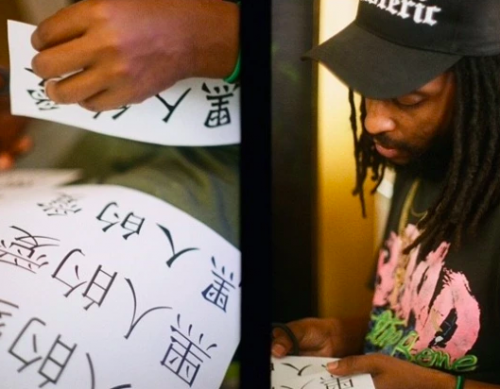 Powerful, culturally symbolic imagery which is recurring in Erizku's oeuvre, such as the Black Panther, the bust of Nefertiti, and Erizku's iconic hand and rose are combined with potent phrases in Chinese characters such as 'Black Panther', 'Black Power' and 'Black Love', respectively. Erizku has been inspired and triggered by the visual impact and cultural history of Hong Kong during his visits to Asia over the last year, which have been equal parts cultural exchange and artistic interaction with local craftsmen.